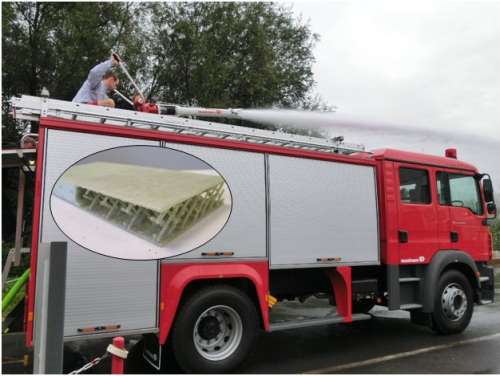 SAERTEX’s SAERfoam is a low density polyurethane foam reinforced with a 3D glass structure and is said to be ideal for the manufacture of composite industrial vehicle bodies. The reinforced SAERfoam core material is designed for use in the vacuum Infusion or resin transfer moulding (RTM) processes and can be used with most commercially available resins, including polyester, epoxy, and vinyl ester. By creating ‘bridges’ in both directions of the composite panel/sheet, SAERfoam can help optimise the mechanical properties of the structure to give the best ratio of performance to weight. I Grade. Whereas the X and O grades are designed for applications where shear resistance is important, I grade is engineered designed for use where compression is an important factor. This grade includes a 450 g CSM on both sides to help improve productivity. SAERTEX reports that the main applications for SAERfoam currently include industrial vehicle bodies and civil engineering fittings. The core material can be supplied with custom finishing, for instance, with grooves, or as a kit.